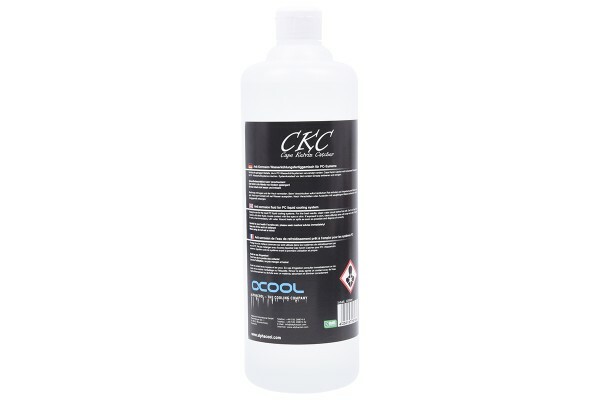 Alphacool CKC is a specially developed coolant for PC watercooling systems. CKC is based on well-proven ingredients which were tested in industrial applications. This ensures maximum reliability and performance. CKC contains a special copper anticorrosive and does not contain Ethylene glycol, Ethandiol or other additives, offers the full thermal capacity of water and suppresses Algae and bacteria growth. It also contains additional inhibitors against corrosion. Alphacool does not use the standard anti-freeze ingredients which reduce the thermal capacity of the coolant but my be mixed with those. Coolants based on antifreeze require 25& antifreeze content to suppress algae and bacteria growth which lowers the thermal capacity. CKC is compatible with copper, brass, platings such as nickel, chrome, anodized Aluminum, Plexiglas (PMMA), POM and plastics for pump casings such asPPS-GF40 (Laing DDC ® amongst others) as well as PUR-, PVC- Tygon® and Masterkleer® tubing. Description of this coolant says: UV - color: Non UV-active Color: Transparent Important: As this coolant contains dye it cannot be guaranteed that it will not stain e.g. clothing or other materials when coming in contact. Please also note that dye fades with time and the intensity of the colour may decrease. How can it be transparent and contain a dye??? It is clear water and it is has no UV. It dont contain a dye but some additives. If that additives get in touch with closes it can change the color of the clothes. Wo kann ich das verbrauchte Produkt entsorgen? Wenn es biologisch abbaubar und nicht Wassergefährdend ist, kann es dann in den normalen Abfluss gegeben werden? Sie können es ganz normal in ihren Abfluss kippen. Das muss individuel erfragt werden, eine pauschale Aussage ist aufgrund der vielen verschiedenen Farbzusätze mit unterschiedlichen Innhalten nicht möglich. Bitte dazu einfach unseren Support eine Mail schicken mit der Information welchen Zusatz sie hier exakt verwenden möchten. Kann ich sie benutzen um meine Eisbaer 360 AIO wieder zu befüllen (nachzufüllen) oder sollte ich den AGB komplett leeren und nur CKC verwenden? Vielen Lieben dank im Voraus. Hallo sie können das CKC ohne weitere bedenken nachfüllen, da der Flüssigkeit in der Eisbaer das verträgt. Seht gutes Kühlmittel. Hervorragende Wärmeleiteigenschaft. Meiner Meinung nach das beste was ich je getestet habe. Die Wassertemperatur konnte ich um gut 4 Grad senken im Gegensatz zu Mischungen mir Farbe. Sehr sehr gute Kühlflüßigkeit! Hatte damit bisher keine Probleme. Das Kühlmittel riecht neutral und enthält Korrosionsschutz, greife immer wieder gerne darauf zurück!